Do you need to make millions of predictions for your new data in real-time? The BigML PredictServer is a dedicated machine image which you can deploy in your own cloud to make lighting-fast predictions using your BigML models. PredictServer is available from Amazon Web Services as an EC2 image. Get it for FREE and pay only for what you use. The BigML PredictServer keeps your models in memory and is optimized to make predictions quickly. In addition, the PredictServer can be deployed in an AWS region closer to your application to reduce latency. 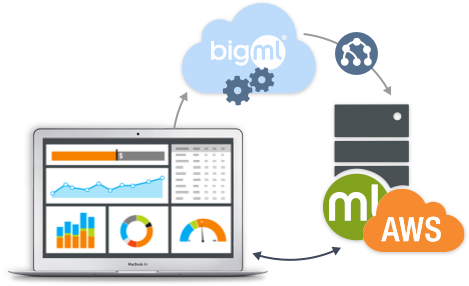 Seamlessly integrate the BigML PredictServer with your existing applications and data center. The PredictServer performance scales with the CPU available. You can also instantiate multiple PredictServers to increase speed for larger amounts of data. 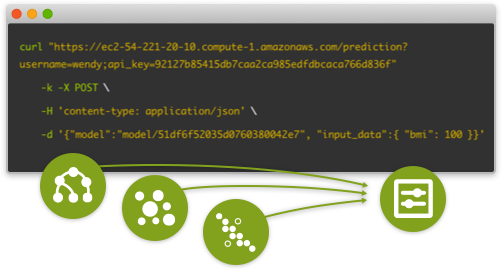 Deploy the BigML PredictServer in your own AWS cloud. Cache models, ensembles, clusters or anomalies from BigML and make predictions via API calls. The PredictServer API is compatible with BigML's API and can be easily swapped in to support code integrated with BigML. Deploy the BigML PredictServer from the AWS Marketplace using 1-click. In the AWS console, note the hostname and the instance-id of your BigML PredictServer instance. In the example below hostname= ec2-54-221-20-10.compute-1.amazonaws.com and instance-id= i-54f1bc39. curl -k -X GET "https://ec2-54-221-20-10.compute-1.amazonaws.com/model/51df6f52035d0760380042e7?username=wendy;api_key=92127b85415db7caa2ca985edfdbcaca766d836f"